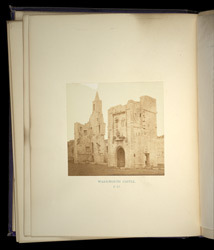 This view of Warkworth Castle in Northumberland illustrates an 1866 edition of Sir Walter Scott’s long narrative poem ‘Marmion’. The photograph accompanies verses describing the sad reflections of Clara de Clare, the poem's heroine, as she journeys by sea to Lindisfarne Priory on Holy Island. The unwilling object of Lord Marmion’s affections, she has become a broken-hearted novice at Whitby Abbey. As she stares blindly at the waves, she sees in her mind’s eye a “sun-scorched desert, waste and bare”, where lies a corpse, perhaps that of her lost lover, de Wilton. On its way along the Northumberland coast the boat passes various landmarks including Warkworth Castle, “proud of Percy’s name”. Of Norman origin, the castle passed to the Percy family, Dukes of Northumberland, in the 14th century, but is now a ruin. With Bamburgh and Alnwick Castles it became part of a chain of defence against the Scots and was besieged several times. Sir Walter Scott (1771-1832) was the Scottish author of immensely popular historical novels and poems. Their epic combination of history, heroism, and romance was especially beloved by readers of the Victorian era. ‘Marmion: A Tale of Flodden Field’, first published in 1808, tells the story of the noble but arrogant Lord Marmion, a fictional 16th-century English knight in the time of Henry VIII, and the fate of his two loves, Clara and Constance Beverley. The story is intertwined with the political antagonism of the time between England and Scotland. When Henry VIII attempted to invade France, James IV declared war on England and led an invading army south. The poem takes its title and inspiration from the Battle of Flodden Field in Northumberland in 1513, at which James was defeated and killed with many of his Scottish nobles and thousands of his feudal army. This edition of the poem is illustrated with 15 photographs by the Glasgow-based photographer Thomas Annan of sites in Northumberland and Scotland which feature in the poem.